Here comes Peter Cottontail, hopping down the bunny trail. Hippity hopping, Easter 2015 is on its way. I'm sure you’re following the custom of the Easter egg. This time, the most elaborate Easter egg is not real egg. What is it exactly? Let’s begin our exploration at the beginning. Every year, every special day, WonderFox Software will operate some exclusive giveaways to rebound our customers. 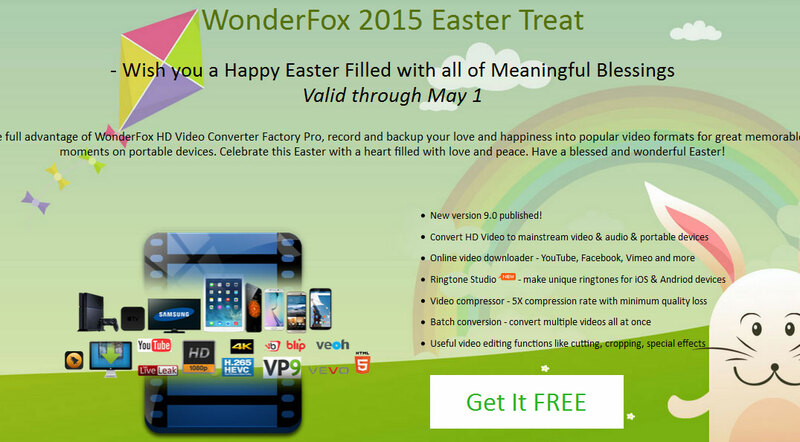 This Easter, WonderFox HD Video Converter Factory Pro version 9.0 finally comes carrying a lot of expectation. This Easter, take up your digital camera to record happytime with family & friends. With this HD Easter egg, convert and back up your memorable moments with ease. This Easter giveaway will continue until May 1. 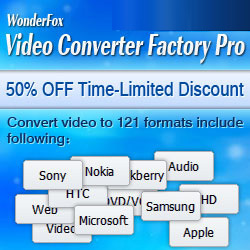 Without any hard rule, anybody can get a registration code of WonderFox HD Video Converter Factory Pro if they just visit the giveaway page and join us! You may ask, what can we expect from the software? Well, just see the following list. 2. Support 4K, H265 and VP9 etc. 3. Online video downloader - YouTube, Facebook, Liveleak, Vimeo, MetaCafe, etc. 7. Useful video editing functions like cutting, cropping, special effects. Time is limited. Quick to join us in the relay to transfer love and happiness!